It can be dangerous to have brunch if you’re Geraint Wyn Davies. One recent morning, at a favorite Capitol Hill haunt, the veteran of stage and screen was partaking in some breakfast when he was interrupted. Who recognized him for three different roles. Wyn Davies laughs. It has been quite a ride. The actor, born in Swansea, Wales, began his career in England before settling in for a decade-plus run as a member of the ensemble at Canada’s Stratford Festival, where he estimates he has performed in “24 or 26” of the plays from Shakespeare’s 36-play canon. He has also frequently been featured on Canadian and U.S. television, and his deep backlog of roles causes fans to recognize him as “that guy” from shows both cult and blockbuster. 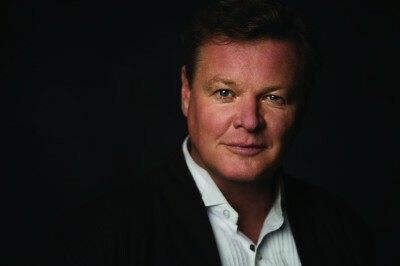 This is the fourth time Wyn Davies has come to STC, and he has fond feelings for the company where he won a Helen Hayes Award in 2005 for his turn as the title character in Cyrano and a Helen Hayes nom for his stint as Don Armado in Michael Kahn’s 60s-themed Love’s Labor’s Lost, a production that also performed at the Royal Shakespeare Company. In fact, during that 2006 stint in Washington, Wyn Davies was sworn in as a U.S. citizen. “We needed somebody last minute, because my green card was expiring,” Wyn Davies says, “and we were going over to Stratford-upon-Avon with Love’s Labor’s. By the time I came back, it would have been expired and there would have been a huge kerfuffle. I mentioned it to a board member, who very casually said, ‘Oh, I know someone who might be able to help.’” The friend? Washington’s biggest Shakespeare fan herself, Justice Ruth Bader Ginsburg. So, what were the three roles in which those dogged fans at brunch recognized him? One was Nick Knight, a thousand-year-old vampire turned Toronto private detective from the much-beloved Canadian series Forever Knight. “It was one of the first vampire shows,” Wyn Davies says, “many years before it became this huge Hollywood genre.” The second? James Nathanson, the terrorist-abetting turncoat CIA agent from the fifth season of the smash-hit 24. The third was from the much-beloved cult series Slings and Arrows, in which many of Stratford’s finest actors appear in a location that looks suspiciously familiar. Contrary to popular belief, and unlike his incurably pompous, director-baiting (and ill-fated) Sling and Arrows character Henry Breedlove, Wyn Davies did not perform his most famous speech from The Tempest for the entire company before the first day’s read-through. 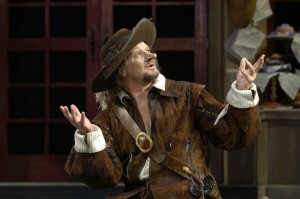 Wyn Davies as Cyrano. Photo by Richard Termine. 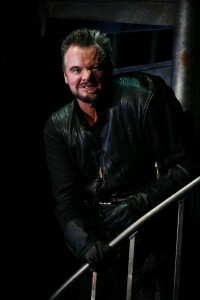 Wyn Davies as Richard III. Photo by Carol Rosegg. 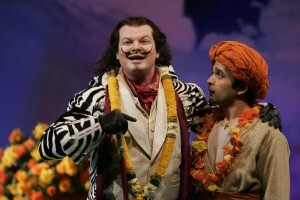 Wyn Davies as Don Armado, with Nick Choksi. Photo by Carol Rosegg. “He’s such an observer. He has other people do his bidding, and then he basically comments on it. He’s almost like a reviewer, or a critic of his own life. Ariel comes and reports to Prospero and he then takes that and writes over it. He’s rewriting his own story, commenting on it in front of the audience. Everybody else in the play is active, but as Prospero you have to watch and think. Wyn Davies as Prospero. Photo by Scott Suchman. 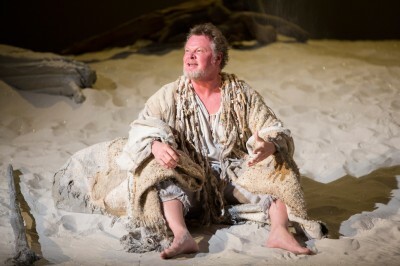 The Shakespeare Theatre Company’s production of The Tempest runs through January 11 at Sidney Harman Hall.